WASHINGTON — President Donald Trump's revised travel ban eases some of the legal questions surrounding the previous order, but critics said it does not answer all of them, including accusations that the measure is a thinly veiled attempt to discriminate against Muslims. Opponents promised to challenge the president again in court. The new, narrower ban announced Monday temporarily bars new visas for citizens of six predominantly Muslim countries — one fewer than the original ban, with Iraq removed from the list. It also suspends the entire U.S. refugee program. The measure applies only to refugees who are not already on their way to the United States and people seeking new visas. It removes language that gave priority to religious minorities. Critics said the language was designed to help Christians get into the U.S. and to exclude Muslims. The changes will make the new executive order tougher to fight in court, but they "will not quell litigation or concerns," Stephen Yale-Loehr, an immigration law professor at Cornell University Law School, said in a written statement. "U.S. relatives will still sue over the inability of their loved ones to join them in the United States," he said. "U.S. companies may sue because they cannot hire needed workers from the six countries. And U.S. universities will worry about the impact of the order on international students' willingness to attend college in the United States." The American Civil Liberties Union promised "to move very quickly" to try to stop the order. New York immigration attorney Ted Ruthizer said this ban will be "much, much tougher" for a federal judge to block. Courts could find it compelling that the order does not cover all Muslims from all countries, he said. And judges have a history of upholding portions of immigration law that discriminate on the basis of race and nationality when national security is an issue. "There's still the argument that, when you take down all the window dressing, it's still a religion ban, but these are the kinds of nuances that the courts will look at," Ruthizer said. Top Republicans welcomed Trump's changes. Sen. Orrin Hatch of Utah said the revised order makes significant progress toward what Hatch called for after the first version: to avoid hindering innocent travels and refugees fleeing violence and persecution. He urged Trump "to continue the difficult work of crafting policies that keep us safe while living up to our best values." House Speaker Paul Ryan said the order "advances our shared goal of protecting the homeland." States that challenged the original travel ban claimed victory to an extent, saying the changes amounted to an "incredible concession" that the original order was flawed, as Virginia Attorney General Mark Herring, a Democrat, put it. 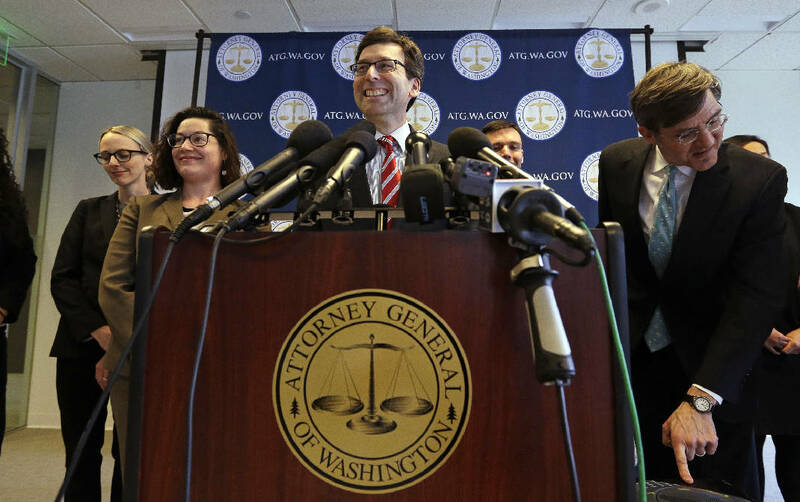 Herring and Washington Attorney General Bob Ferguson, who successfully sued to stop implementation of the original order after it created chaos at airports around the country, said they were reviewing the new order to determine what legal steps to take next. "Although the new order appears to be significantly scaled back, it still sends a horrible message to the world, to Muslim-Americans, and to minority communities across the country, without any demonstrable benefit to national security," Herring said. Massachusetts Attorney General Maura Healey, who joined in the court challenge, described the updated ban as "a clear attempt to resurrect a discredited order and fulfill a discriminatory and unconstitutional campaign promise." Texas Attorney General Ken Paxton, who backed the first ban, said in a statement that the president had the authority to secure the nation's borders "in light of the looming threat of terrorism." Chicago Mayor Rahm Emanuel, a sharp critic of the first ban, said the new version was "nothing more than a wolf in sheep's clothing, different packaging intended to achieve the same result." A spokesman for the 9th U.S. Circuit Court of Appeals, which upheld a Seattle judge's restraining order in the Washington case, said the court was evaluating the new executive order's effect on the existing case. The Justice Department filed papers Monday in federal court in Seattle arguing that the restraining order should not block the new ban from taking effect as scheduled March 16. Critics said the new order failed to address some other concerns, including the notion that the measure attempts to enact the Muslim ban Trump advocated during his campaign. Washington state, joined by Minnesota, argued that the order violated the First Amendment's separation of church and state. The 9th Circuit's ruling did not deal with those arguments, but the court said it would evaluate them after further briefing. The states' claims "raise serious allegations and present significant constitutional questions," the judges wrote. Larry E. Klayman, a founder of and lawyer for the conservative group Freedom Watch, supported the original ban when it was before the appellate court and called the new version "quite modest." "Right now, we're in a state of war with certain countries, and this is a reasonable approach to it," Klayman said. Additionally, a question remained over whether the new ban conflicted with federal immigration law, said Jorge Baron, executive director of the Seattle-based Northwest Immigrant Rights Project. His organization filed a class-action complaint over the initial ban and said it would amend its arguments in light of the new one. "Our immigration laws specifically say you cannot discriminate on basis of nationality in this process," Baron said. "The president can't rewrite the law by executive order."